The African country of Somalia is a place of great suffering. There is famine, war, and all the crimes that go along with them. Anyone looking for a simple-minded good-guy/bad-guy viewpoint should stop reading now, because this story, like all stories, is more complicated than that. This article focuses on the period 1991-1995, when Somalia’s troubles erupted in civil war and became an international issue. Many important events happened before and after that time, but international concerns are more the focus of this website. As with most major events, the single viewpoint shared by the dominant media was misleading. The dominant media’s angle was that Somalia’s troubles were mostly the fault of the bandit-like warlord Mohamed Farah Aideed. The ever-helpful United Nations stepped in for famine relief, and ended up defending themselves from the bad guy Aideed. A less biased observer would point out that Aideed’s leadership had more claims to legitimacy than his rivals’, but he was opposed by Western governments, because they felt someone else was better for their own interests. Aideed is not a saint; again, this is not about good guy and bad guys. When the U.N. stepped in, it committed mass violations of Somalis’ rights, including trying to disarm them and shutting down free speech. After years as Italian and British colonies, Somalia gained its independence in 1960. Siad Barre assumed control of the country in a dictatorship. Aideed spent the late 1960s and early 1970s in prison for planning a coup against Barre. Barre eventually freed Aideed and made him ambassador to India, Sri Lanka and Singapore. By 1990, Barre’s dictatorship had crumbled, and he was deposed. Aideed became a prominent leader of the United Somali Congress, one of the rebelling factions. USC Somalian ex-patriates in Italy then proclaimed Ali Mahdi President of the Republic of Somalia, a claim recognized by very few inside the country. In June 1991, Aideed was elected chairman of the United Somali Congress by a two-thirds vote, but Ali Mahdi refused to step down as President. By October 1991, Ali Mahdi had formed a government of eight ministers, and the Italian government promised massive financial support. Civil war erupted as various clan-based military factions competed for control after the collapse of Barre’s regime. Aideed’s militia forces gained the upper hand, confining Mahdi’s supporters to a portion of Somalia’s capital, Mogadishu. Aideed then concentrated his efforts on violent factions in southern Somalia, which were largely responsible for the famine in that region. In March and June 1993, six clans from northern and central Somalia sided with Aideed, adopting the traditional Somali political system known as the Xeer (pronounced “hair”). In a bloody civil war with devastation on all sides, Aideed’s faction was emerging as the center of a coalition. The United Nations opened an office in Mogadishu a few months after Aideed routed Mahdi’s forces. The U.N. Representative realized he was too late to mediate between the two factions, and concentrated on reducing the famine in southern Somalia. The U.N. Secretary General wanted a more visible role and fired the representative. The new leadership declared Somalia an anarchy, Aideed a bandit, and firearms the problem. The U.N. then embarked on a military occupation of Somalia and an attempt at full disarmament of its population, with the intent of re-establishing a Western-style central government. The U.N.’s expensive campaign resulted in more violence, as the Somali tribes fought to preserve their traditional systems and their right to self-defense. On June 5, 1993, U.N. troops attempted to shut down Aideed’s radio station because it was broadcasting “propaganda” (that is, anti-U.N. messages). In a victory for freedom of speech, Somali militiamen repelled the attack, in the process killing 23 Pakistani U.N. troops. The Somalis’ successful repulse of the U.N. attack led the United States to commit the lives of U.S. troops to an expensive, bloody, five-month manhunt for Aideed. Dozens of U.S. and U.N. troops, and hundreds of Somalis, were killed. In October 1993, the U.S. ended the search after a Blackhawk helicopter was shot down, killing all eighteen U.S. soldiers aboard, some of whose corpses were dragged through the streets of Mogadishu. During the weeks from June 5 to October 3, 1993, U.N./U.S. forces inflicted 6,000 to 10,000 casualties on the Somali resistance, said Eric Schmitt in the the December 8, 1993, New York Times . Schmitt confirmed the account with U.S. military intelligence, relief workers, U.N. officials and the U.S. special envoy to Somalia. U.S. Marine Corps General Anthony Zinni estimated that two-thirds of the casualties were women and children. Many people complain about this web page, almost always because they think it paints the U.N/U.S. as “bad” and Aideed as “good.” To anyone of that viewpoint: There are no good guys in this story. Reread this paragraph until you understand that. Only a small fraction of the money spent by the U.N. on “relief efforts” — the equivalent of hundreds of millions of U.S. dollars — actually benefited Somalis. Most of the money was spent on the U.N./U.S. effort itself, according to the November 28, 1993, Los Angeles Times . Foreign businesspeople profited immensely from such items as fast-food sales to occupying soldiers, a $9-million sewer system in the U.N./U.S. headquarters and helicopter flights for Western officials. Those in power are concerned with money and power, not the noble ideals to which they pay lip service. In March 1994, U.S. and other Western troops withdrew from Somalia, and by March 1995 the remaining African and Asian U.N. troops withdrew. The fighting subsided after this. In June 1995, the United Somali Congress – Somali National Alliance called a Congress, at which Aideed was ousted as chairman, and replaced by former ally Osman Hassan Ali Atto. Atto called for a return of U.N. troops to help “rebuild” Somalia. Aideed refused to recognize the congress, calling it foreign-manipulated, and his supporters established a new faction which elected him president. In September 1995, in a major military move, Aideed and six hundred militiamen siezed the southern Somali city of Baidoa. Fighting in the capital city of Mogadishu erupted again in October 1995 as Ali Mahdi’s supporters fired at a banana ship to keep it from docking. Somalia’s banana export industry is tied to Aideed, and Ali Mahdi has banned banana ships from Mogadishu’s port. Aideed’s rivals say Aideed collects a tax on banana exporters and farmers, and that the banana companies give Aideed military aid. Because I get frequent e-mails on this point, I feel I should say as clearly and plainly as possible: I do not claim that Somalia was militarily superior to the United States, or that it militarily drove out the U.N./U.S. forces. This site has never made that claim, but some people have a strong emotional reaction to the U.S. withdrawal from Somalia, and view that withdrawal as a sign of weakness and humiliation. They would rather kill another 10,000 Somalis to salvage their wounded egos. The point I do make in this section right here, right now, is that the Somalis successfully caused the great modern armies of Western civilization to leave their country. Somali soldiers are militiamen, mostly unpaid volunteers. Obviously, the Somalis did not win by military superiority, but they successfully demonstrated that military superiority is not necessary to achieve goals. Critics of the right to keep and bear arms often deride the notion that untrained individuals with small arms could stand a chance against a well-equipped modern army. Supporters of a large defense budget often claim that a high-tech military is the only possible way to defend a country in today’s world. They are both wrong, as Somalia has so clearly proved. Mere weaponry and training, no matter how advanced, is not the sole or even primary factor of military success. A well-organized citizen militia, protected by the right to keep and bear arms, is still the most effective protection for the security of a free state. It is not necessary to have the latest high-tech gizmos or paid professionals. Someone defending their own country will always have an advantage — psychological and moral — against an invading foreign power. Militias can use tools other than sheer military force to achieve their goals. 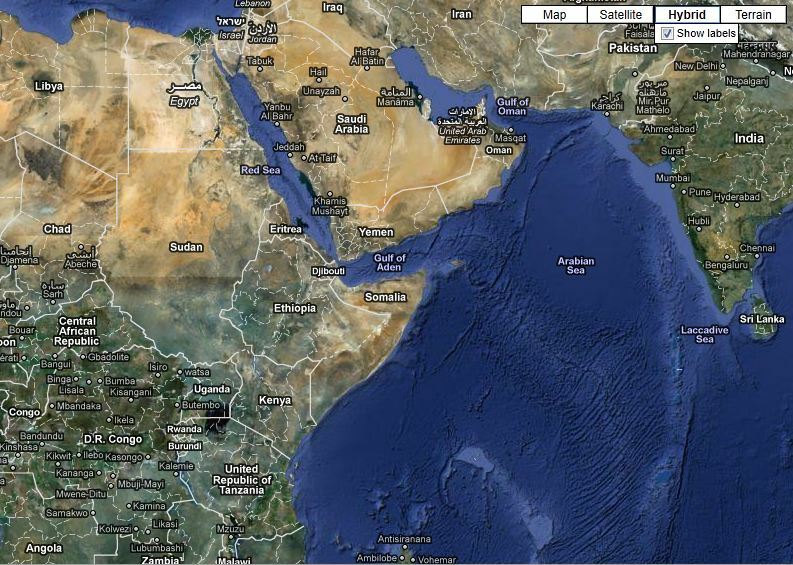 Somalia Who Controls Gulf of Aden:Who Controls The Vast Arabian Sea, Pirates or Sea Guards? Before It’s News: Is the Gulf of Aden Stargate Opening?